Here is a great list of grocery deals going on over at Amazon.com. This is part of their Subscribe & Save program. With Subscribe & Save you get 15% off your regularly used products and have them sent to you on a regular basis. You can cancel at anytime and shipping is always free. Final Price: $0.17 per bag with Free Shipping! Final Price: $0.53 each with Free Shipping! Final Price: $1.40 per container with Free Shipping! Final Price: $1.75 per 10pk with Free Shipping! Final Price: $0.45 per jar with Free Shipping! Final Price: $2.56 each with Free Shipping! Final Price: $0.88 per can with Free Shipping! Final Price: $1.66 each with Free Shipping! The Skippy Peanut Butter Deal is still available, too! Thank you to Julia, The Frugal Find, for this awesome list! 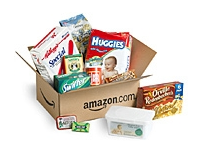 Amazon Subscribe and Save Deals! Lipton Onion Mix $1.11 Shipped! Stretch Island Original Fruit Leather 30 pk. $0.78 each!